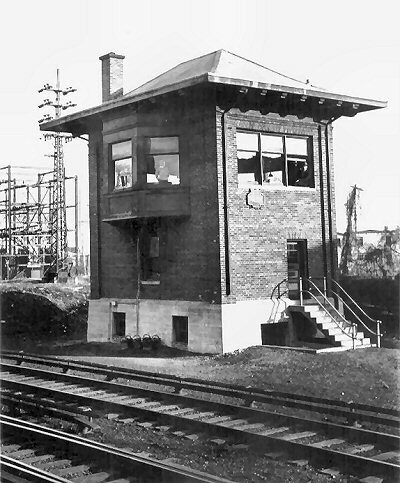 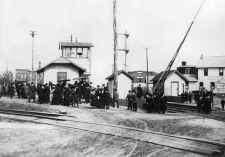 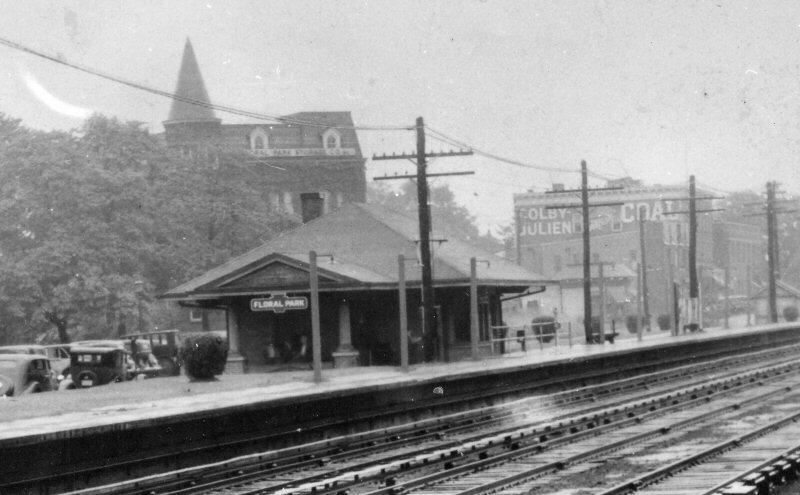 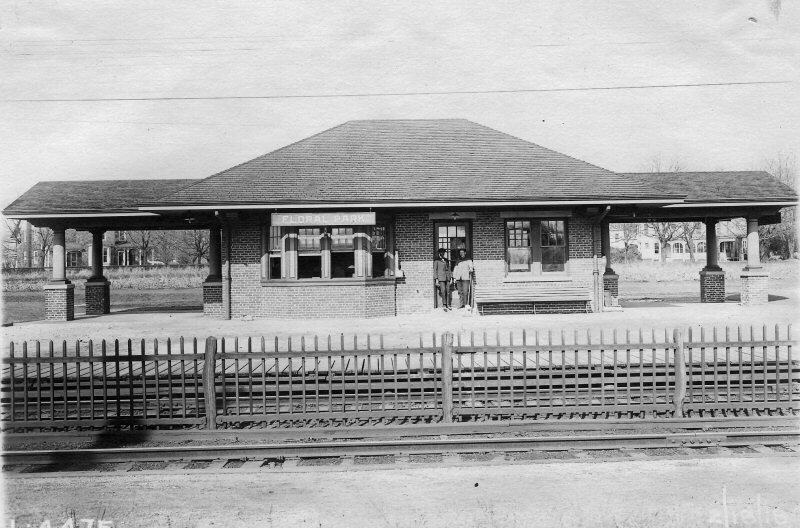 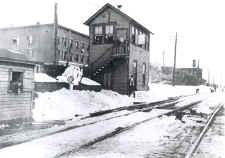 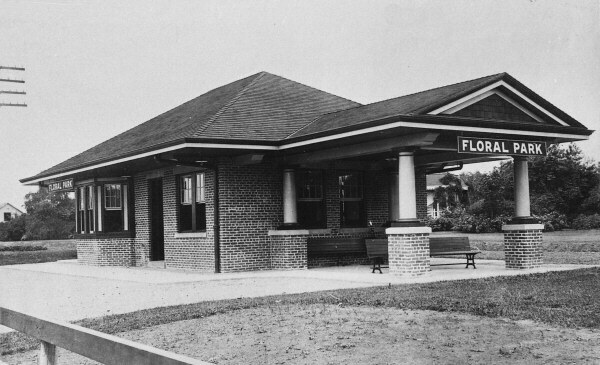 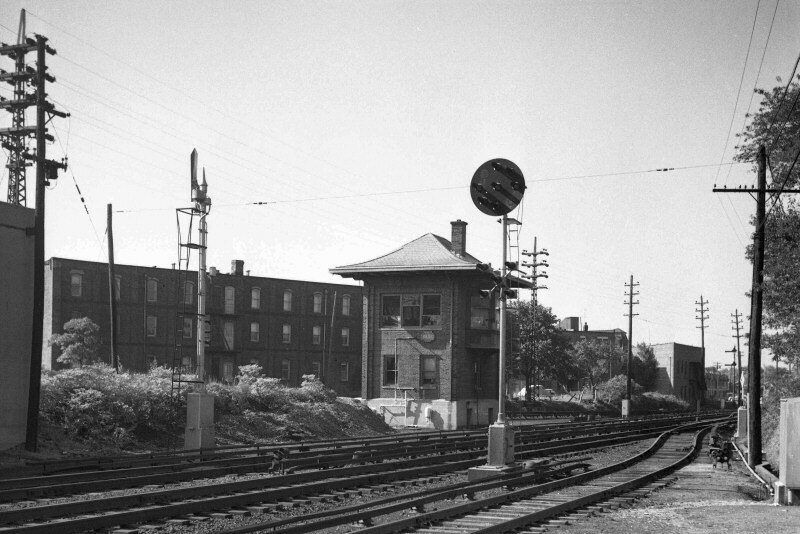 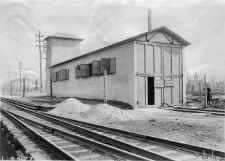 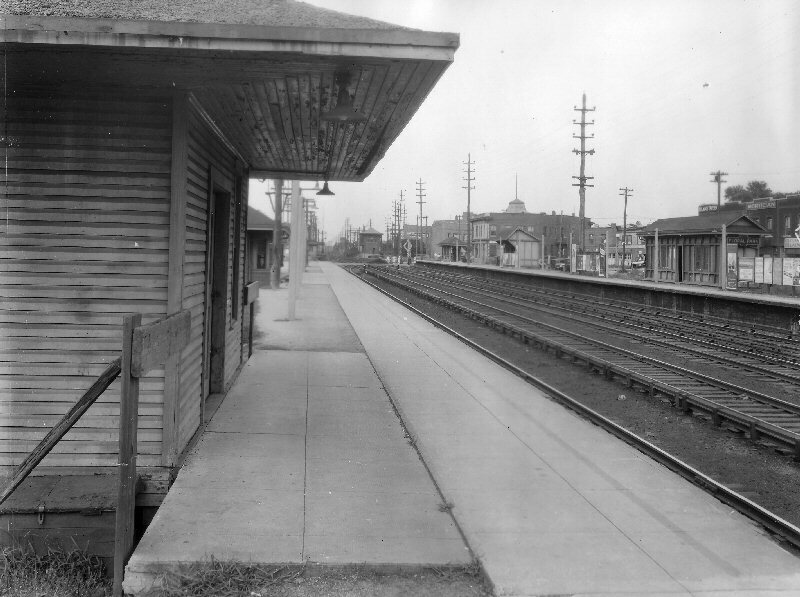 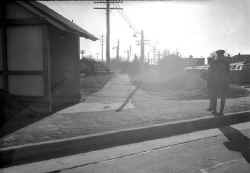 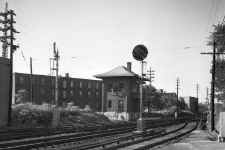 2ND, RELOCATED DEPOT BUILT: 1909, RAZED: 10/20/60 TEMPORARY WESTBOUND STATION FACILITIES RELOCATED TO SHOOFLY S. OF FORMER LOCATION: 12/15/60. 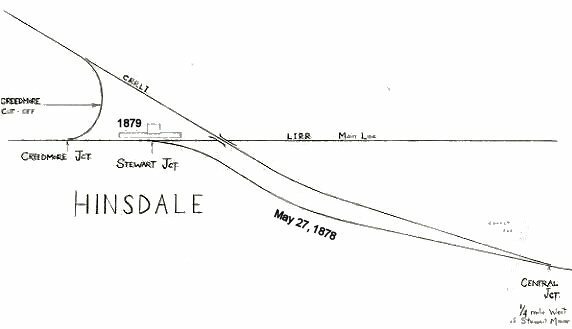 “JN” STEWART JUNCTION (1878 BOOK OF RULES) (LATER: FLORAL PARK AND JCT. 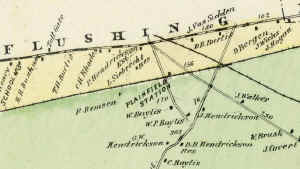 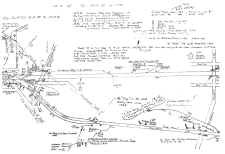 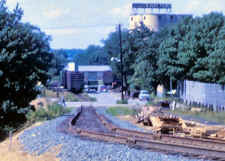 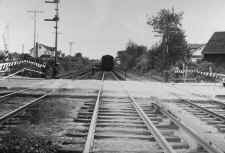 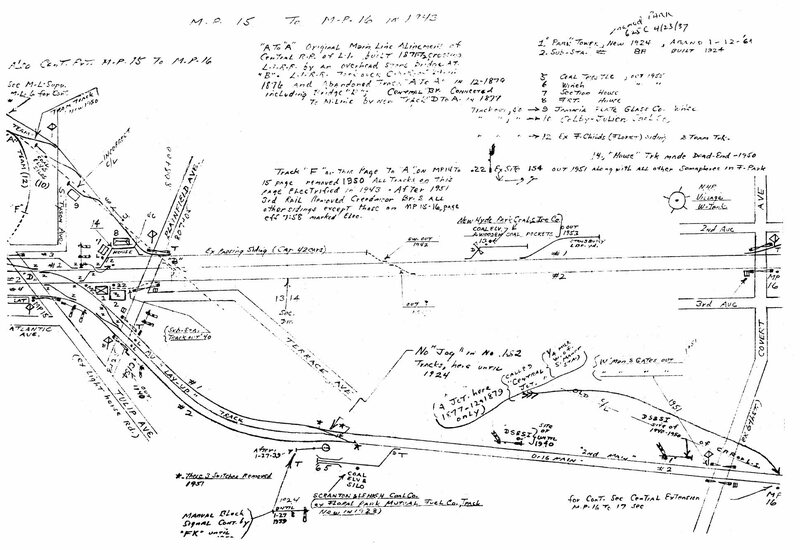 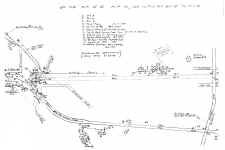 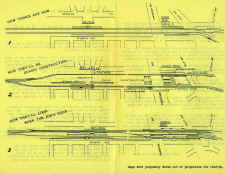 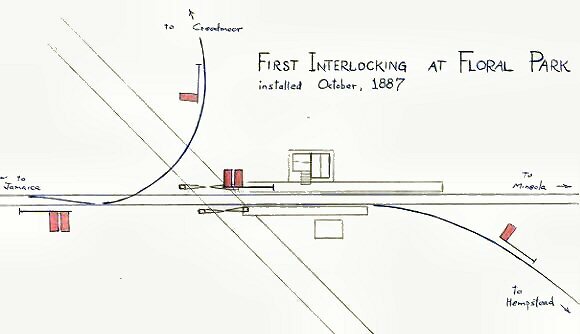 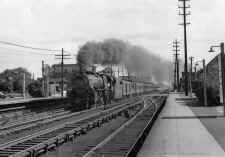 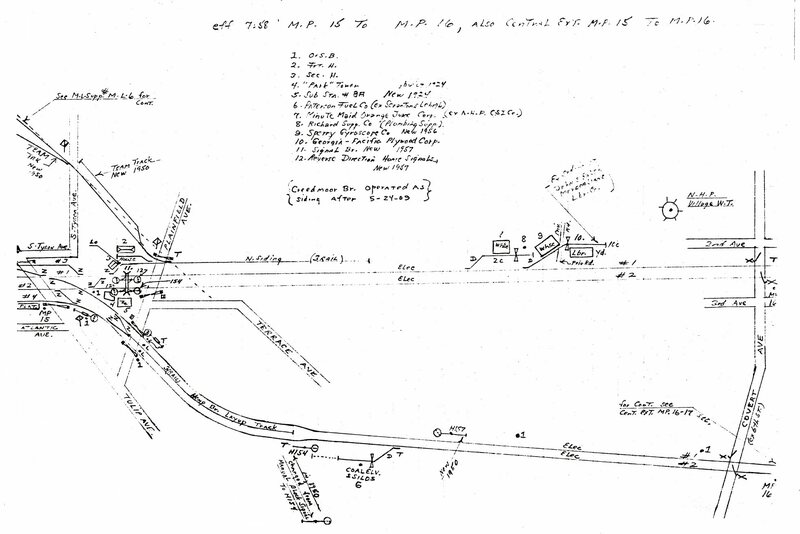 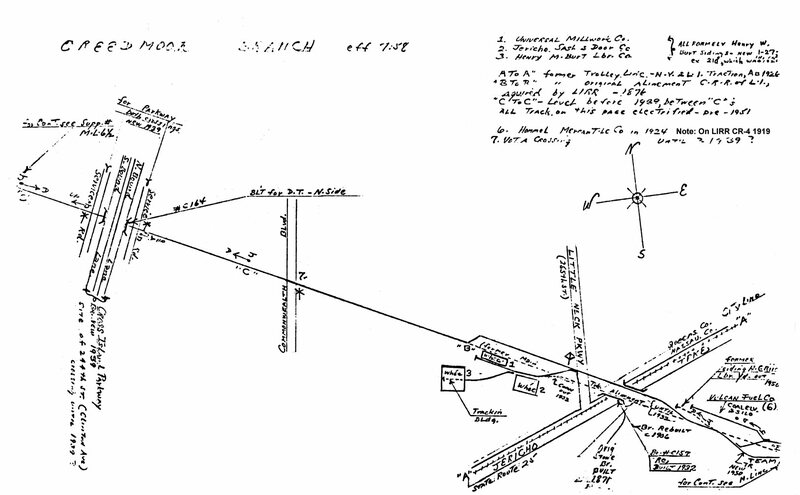 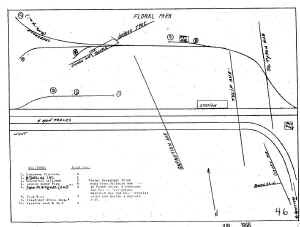 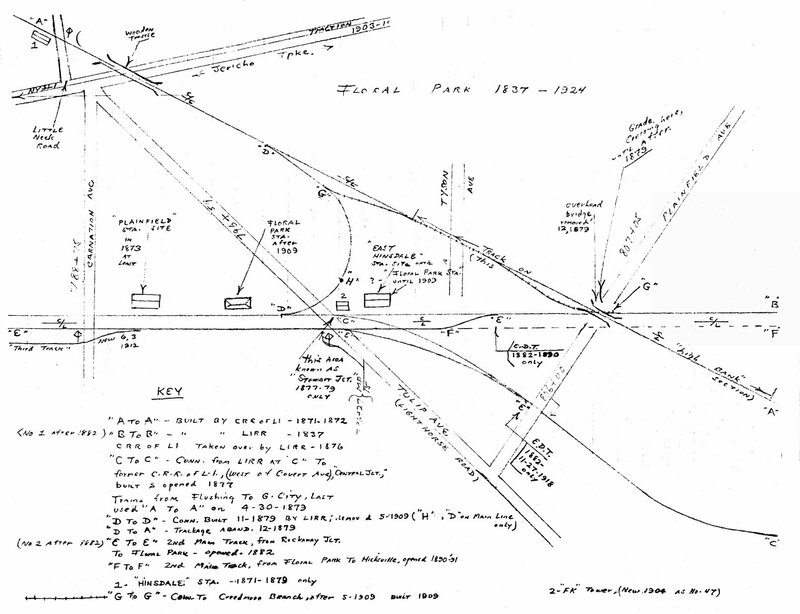 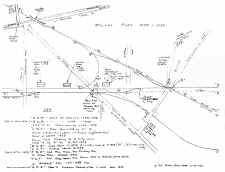 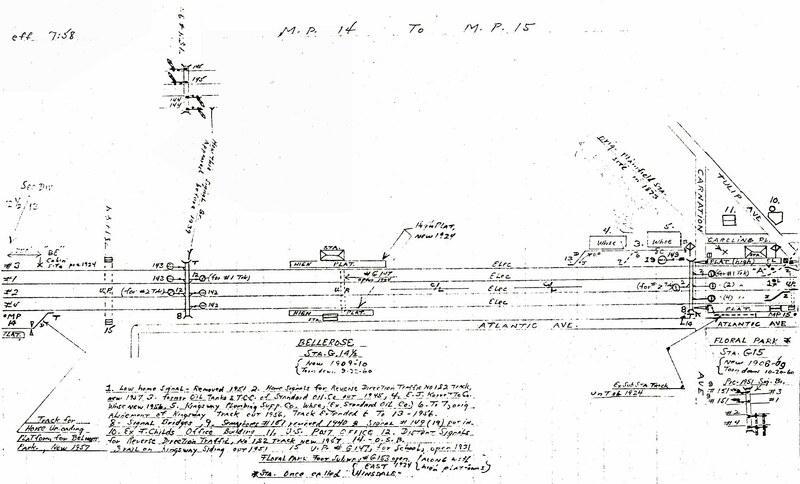 OF CENTRAL EXTENSION AND CREEDMOOR BRANCH WITH MAIN LINE PER 1903 CR4. 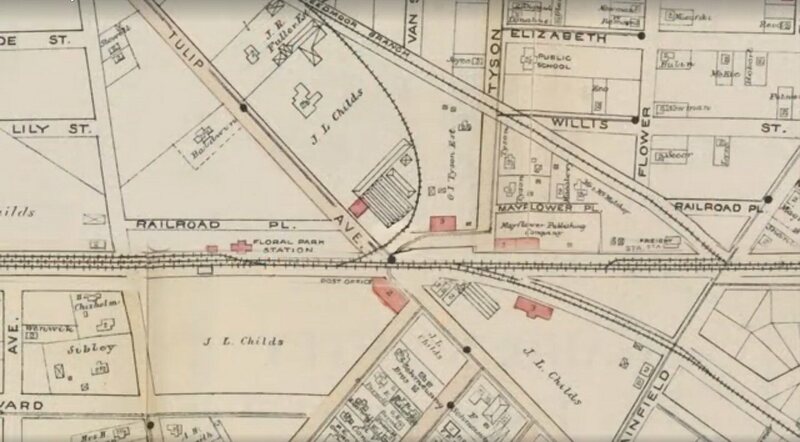 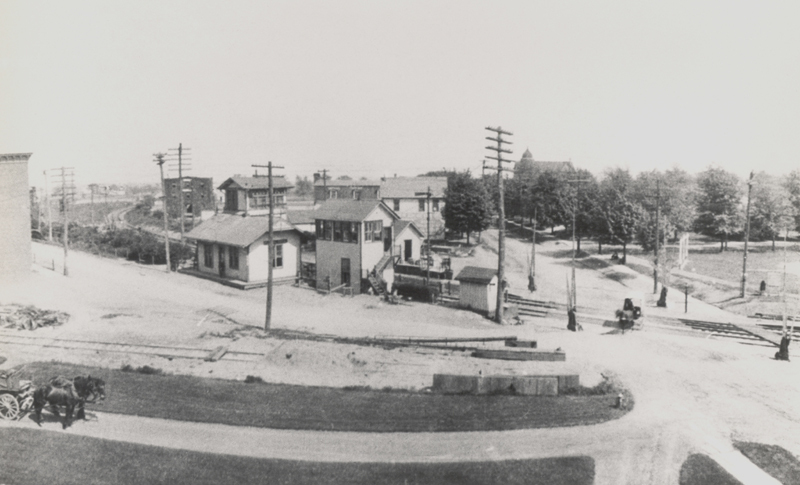 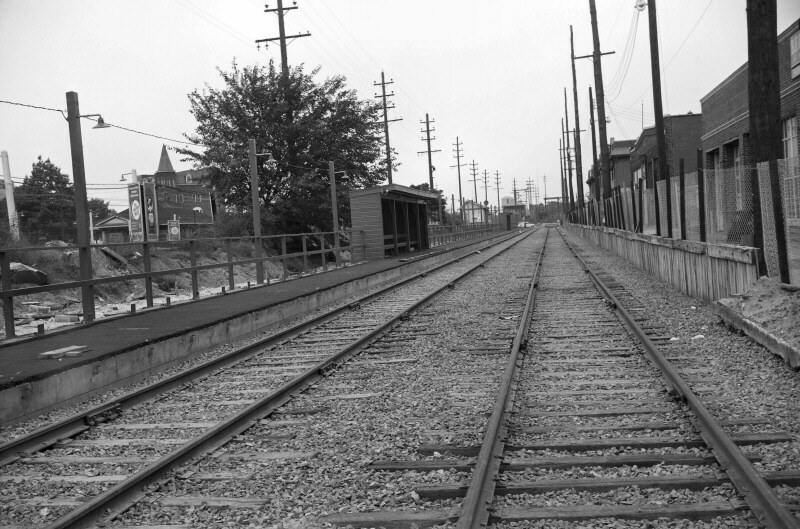 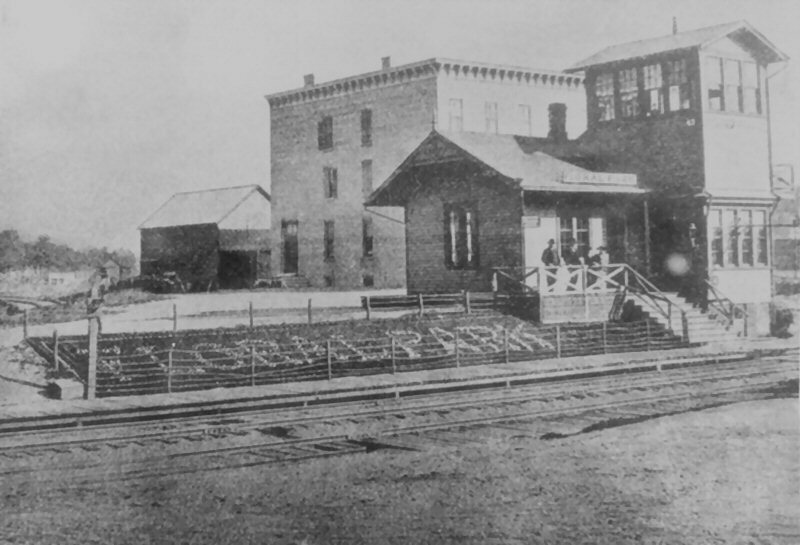 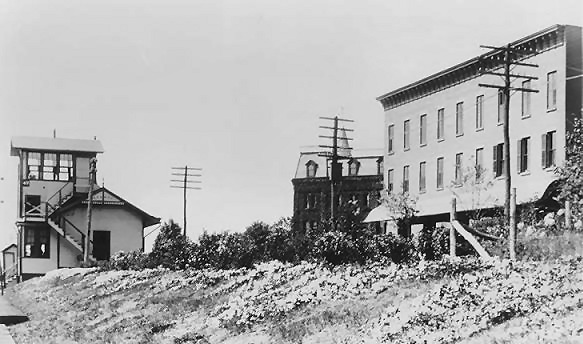 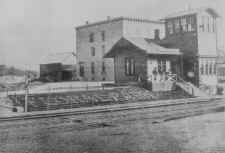 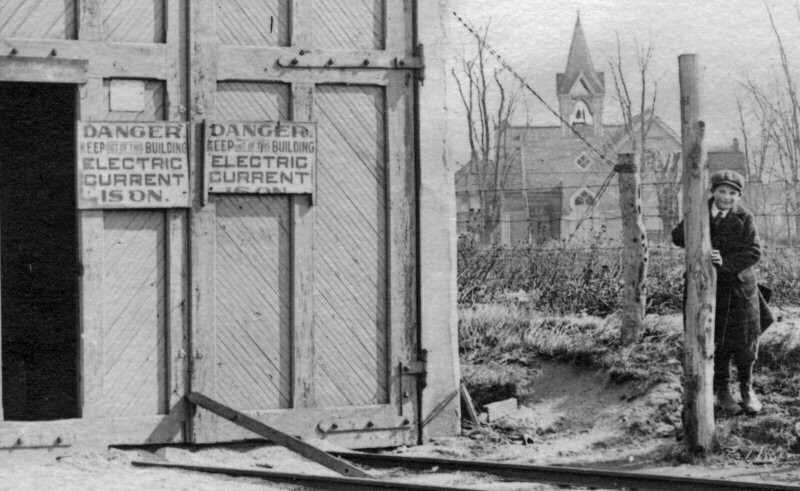 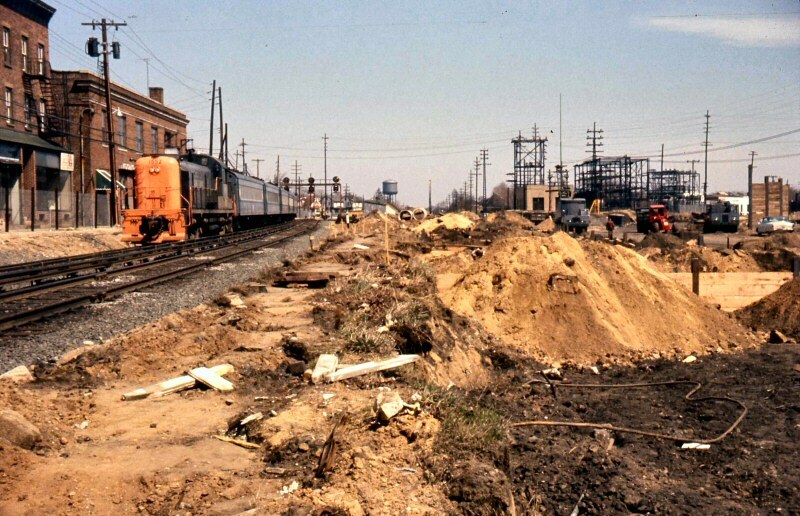 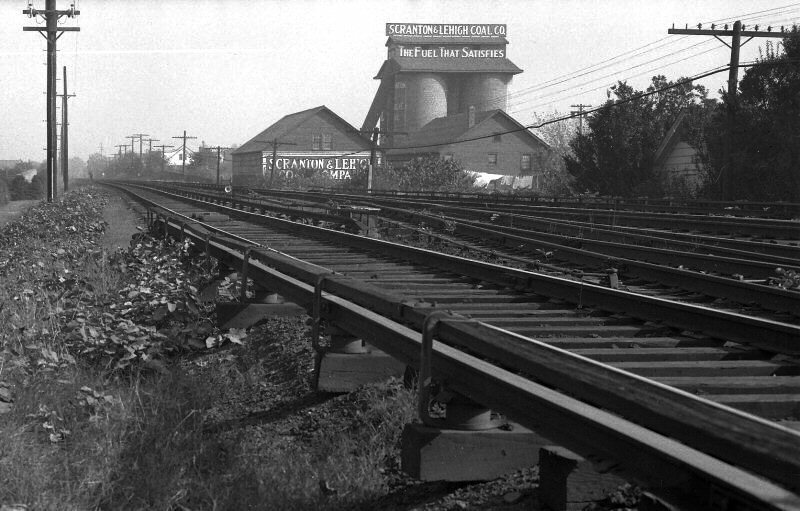 NORTH SIDE OF TRACKS AND EAST OF TULIP AVE., ABOVE 1878 EX-STEWART JUNCTION. 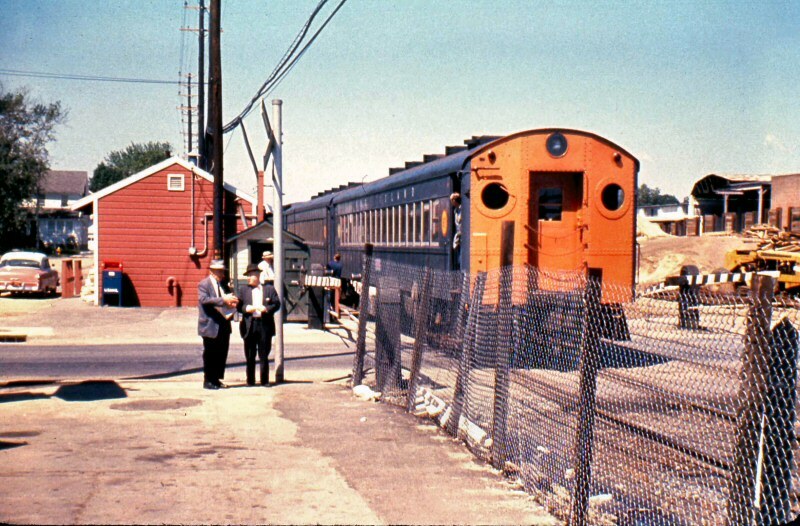 DEPOT. 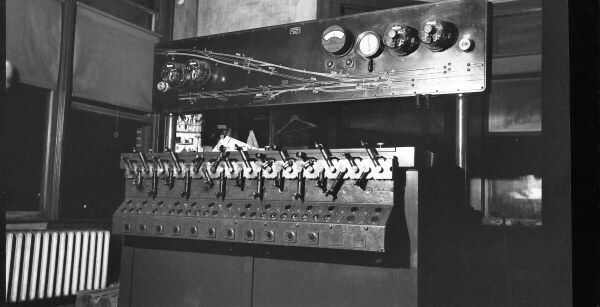 24 LEVER MECHANICAL MACHINE. 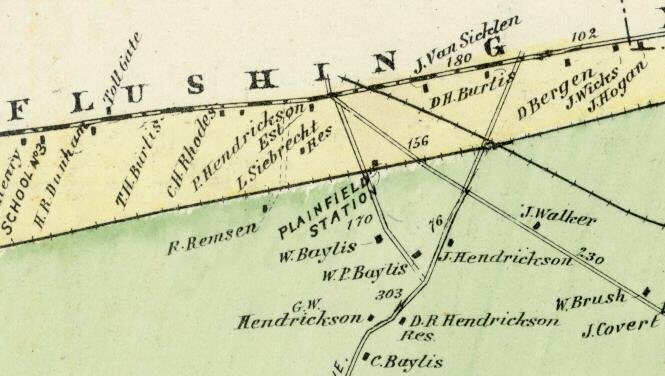 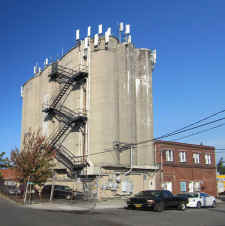 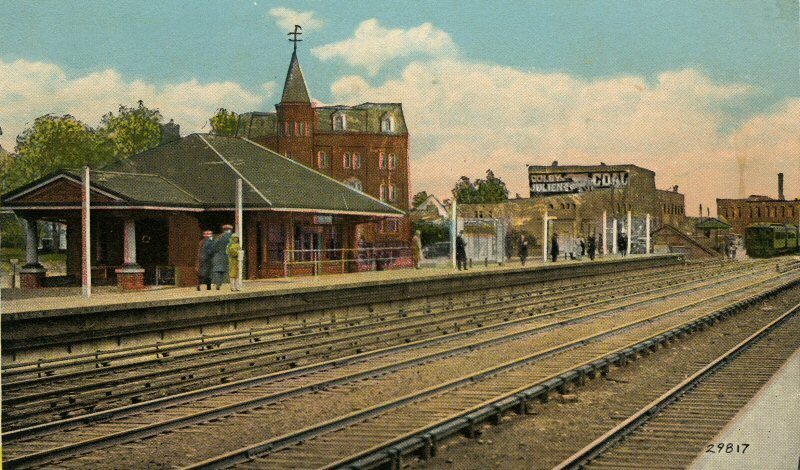 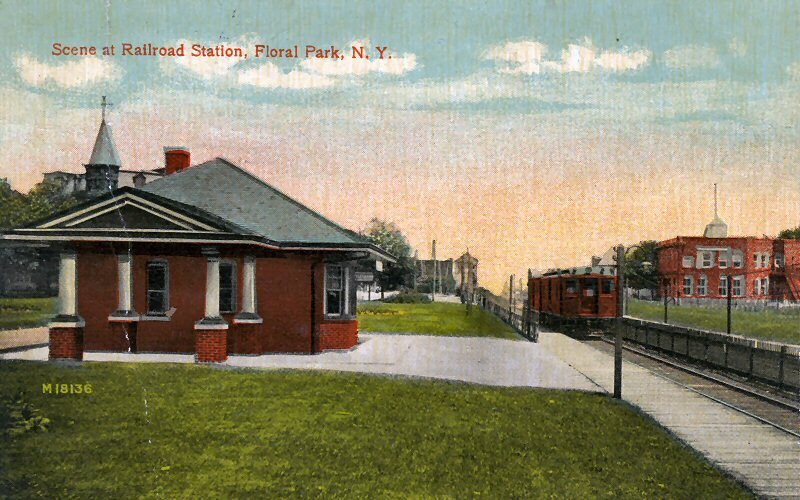 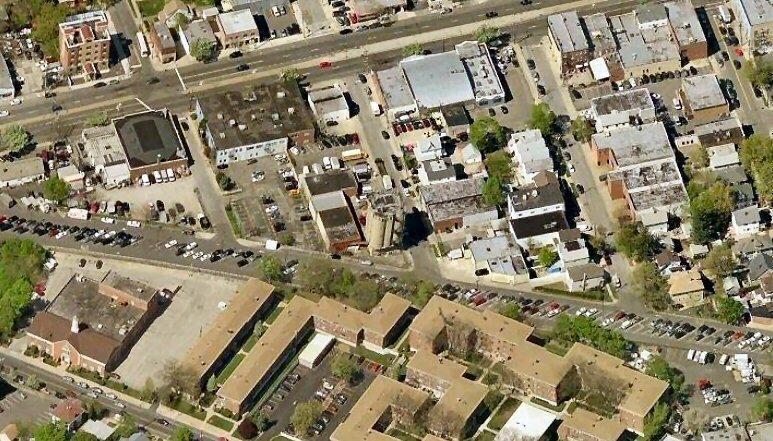 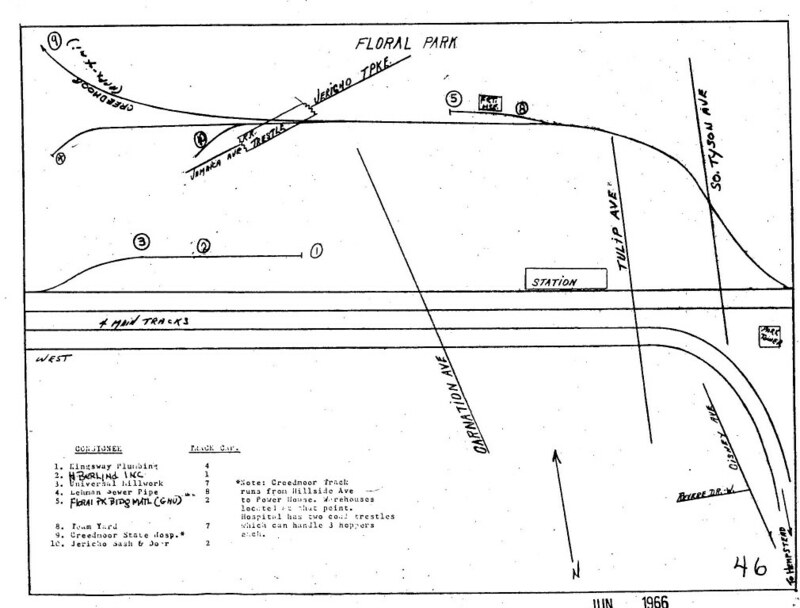 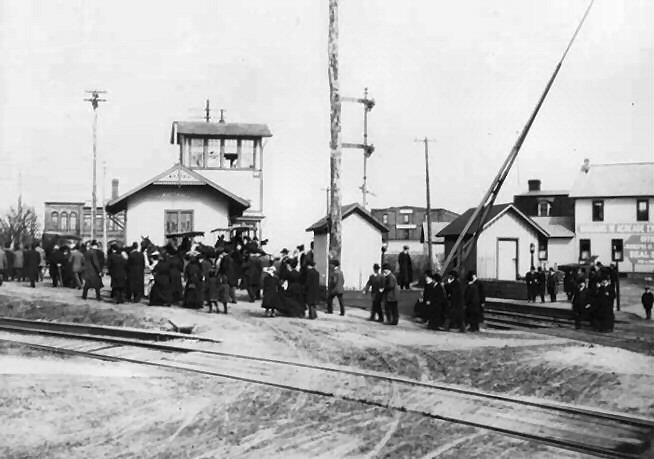 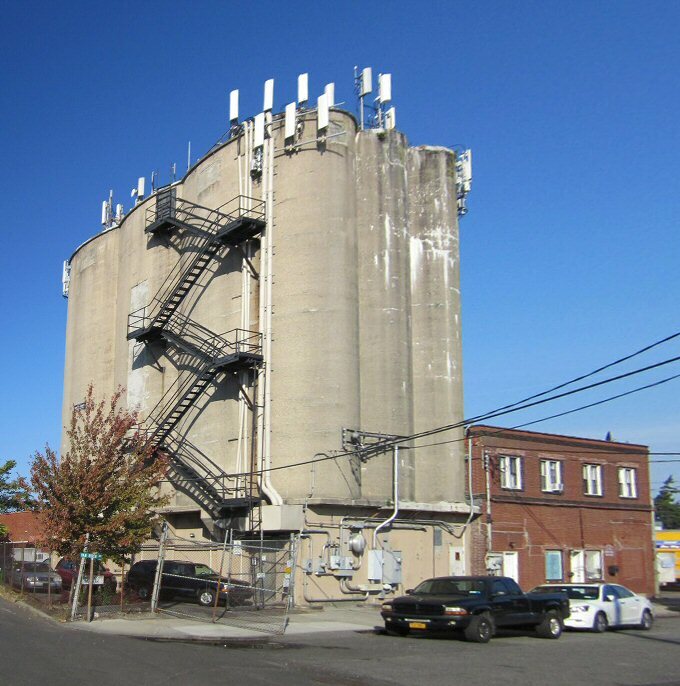 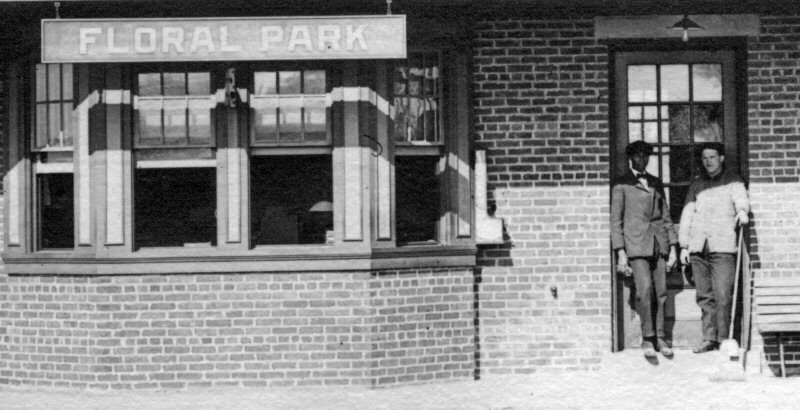 PLAINFIELD STATION: EXISTS ON MAPS BETWEEN 1873 AND 1878 EAST OF CARNATION AVE. AT PRESENT DAY FLORAL PARK. 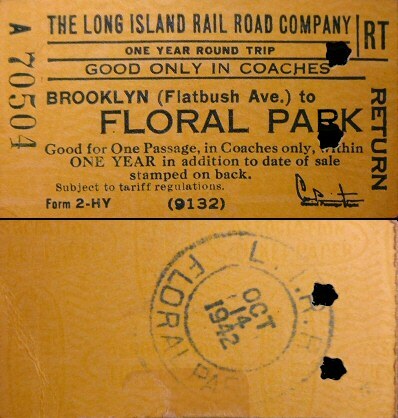 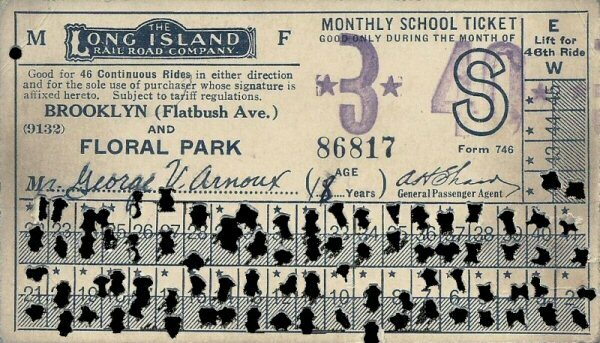 IT DOES NOT APPEAR ON 1874, 1877 OR 1878 LIRR TIMETABLES. 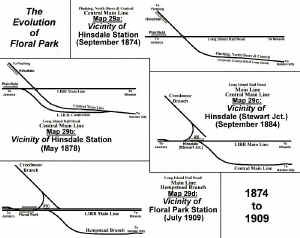 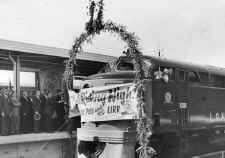 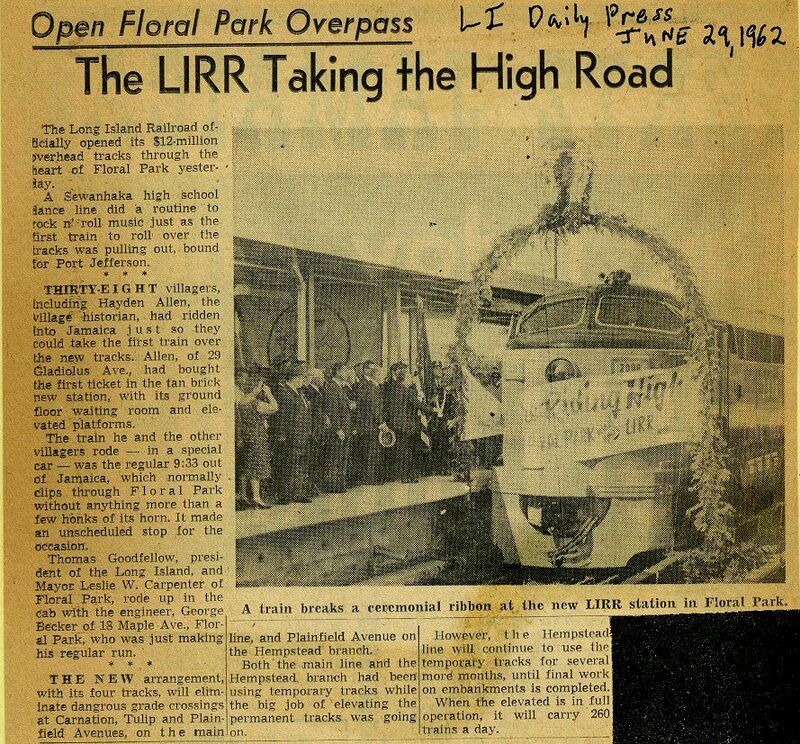 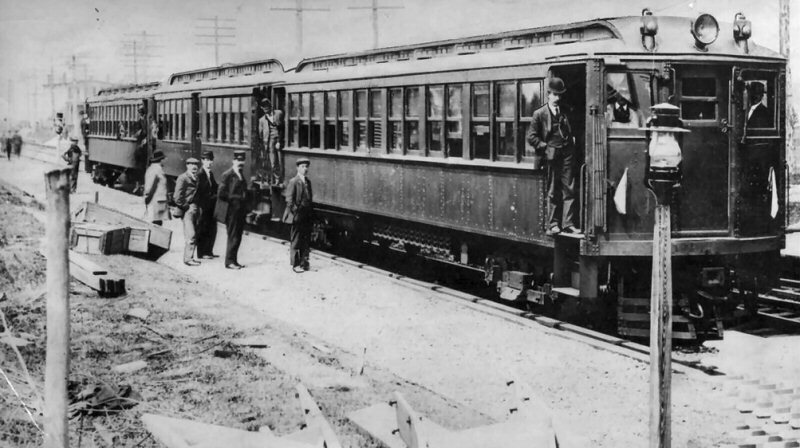 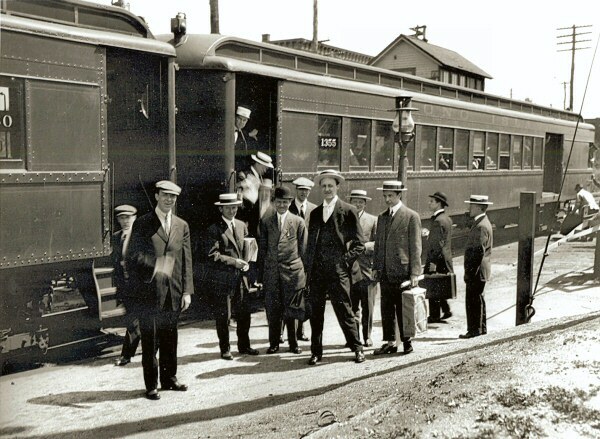 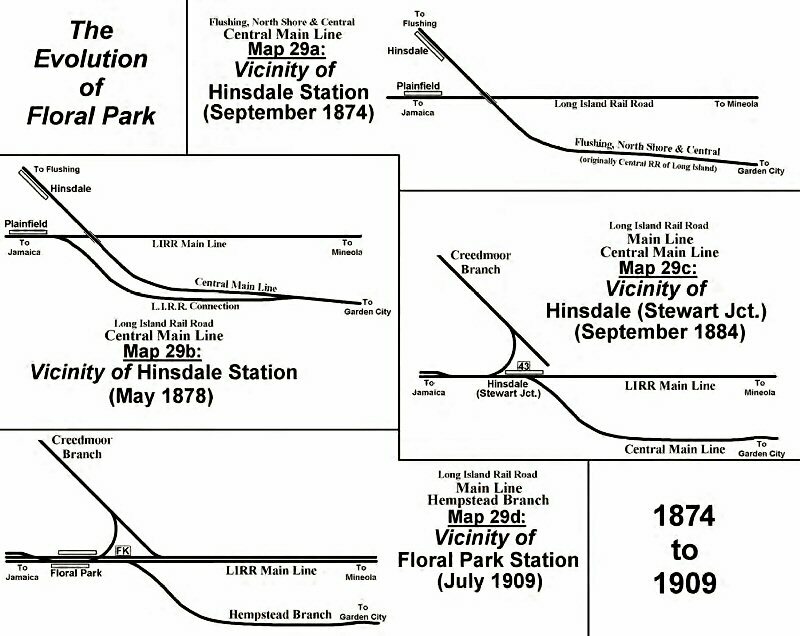 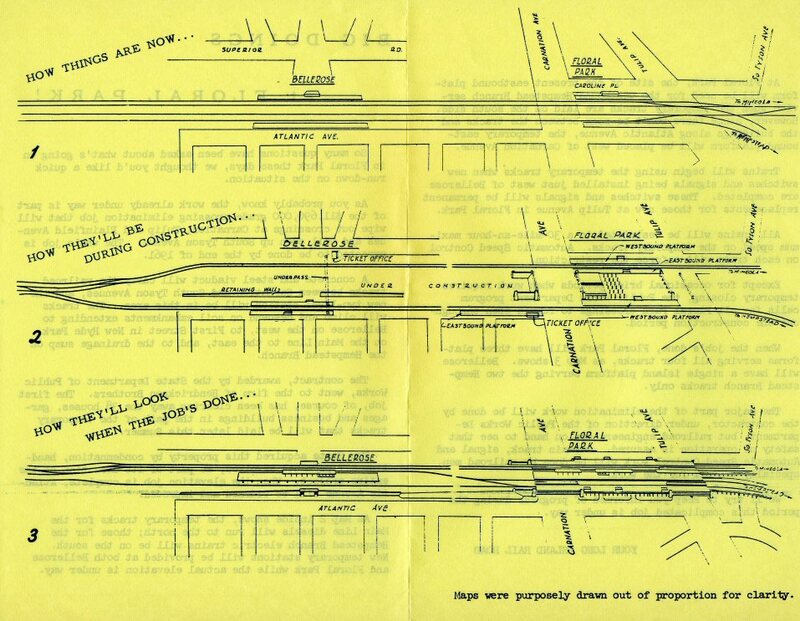 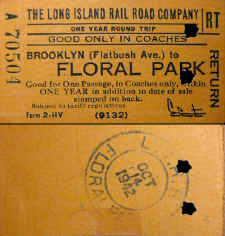 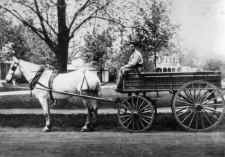 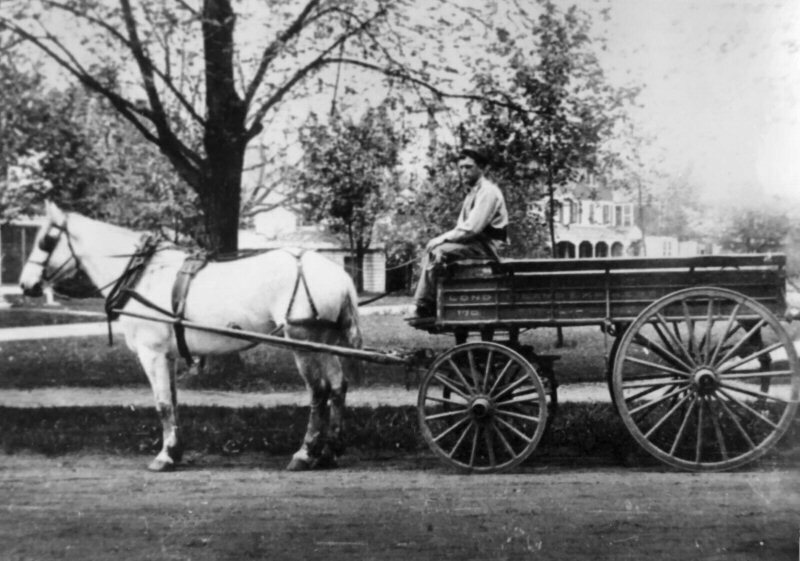 Floral Park evolution maps Research: George Chiasson, Jr.
Irving Lewis Halleran, the driver on an LIRR Express delivery wagon, c.1890's Archive: Scott Halleran, Grandson. 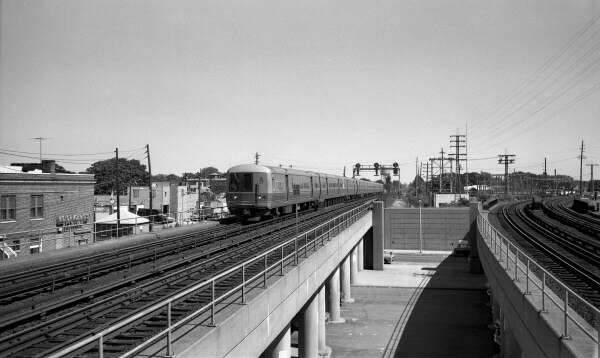 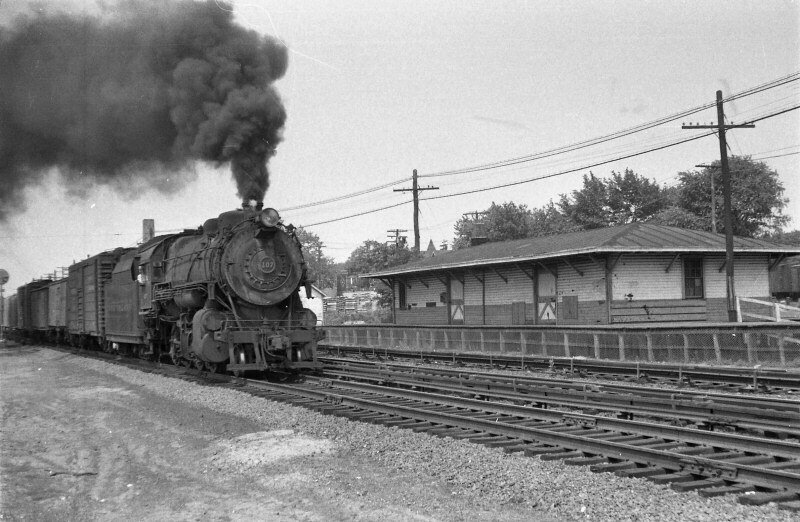 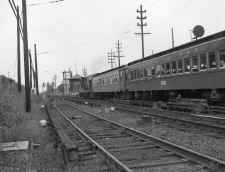 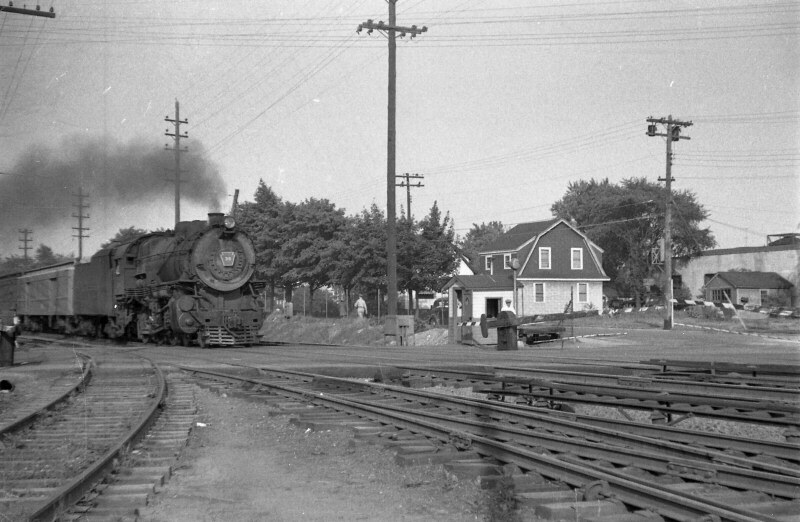 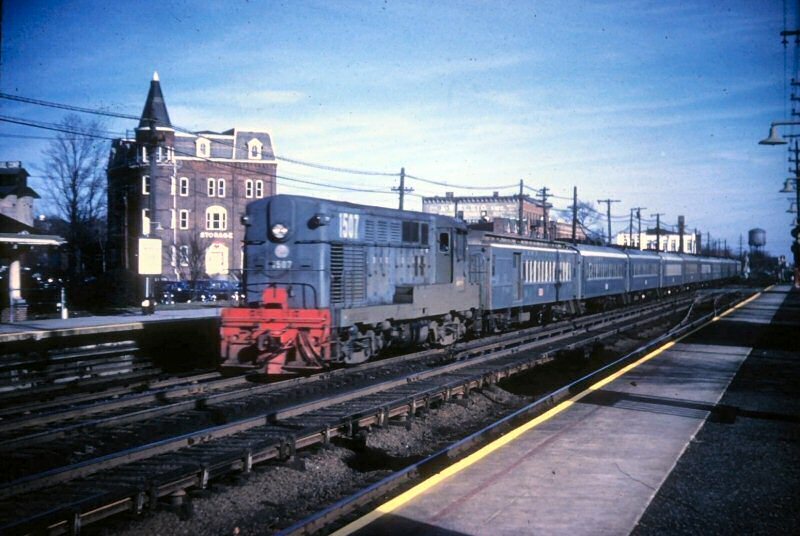 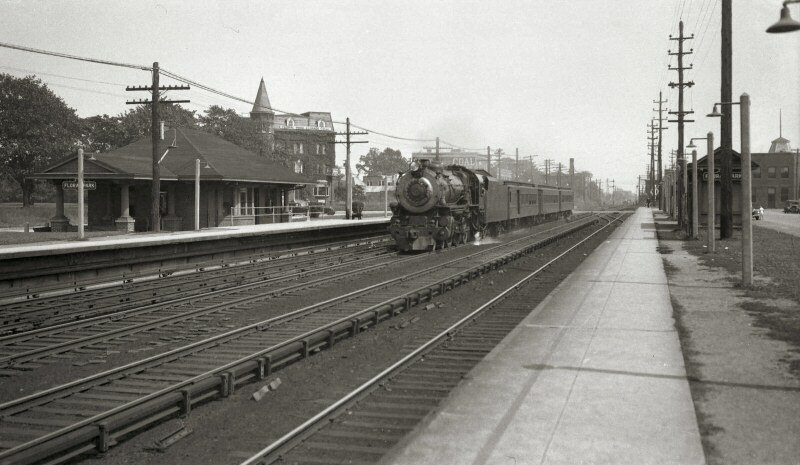 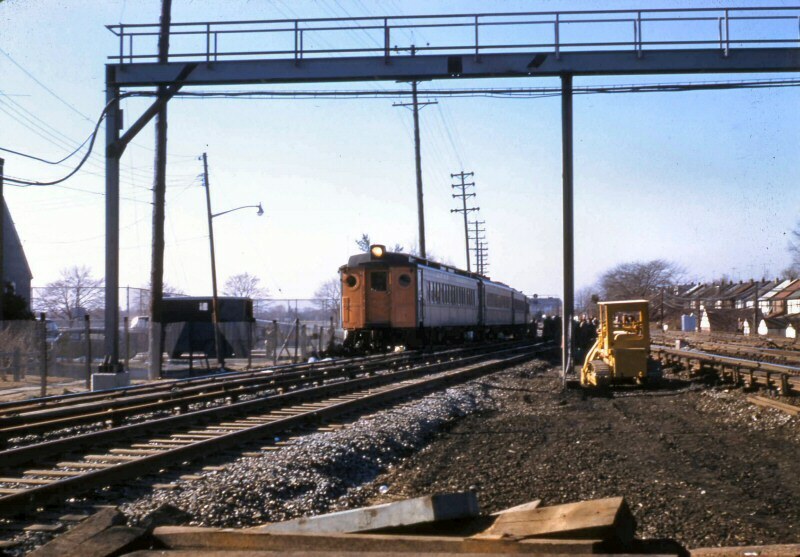 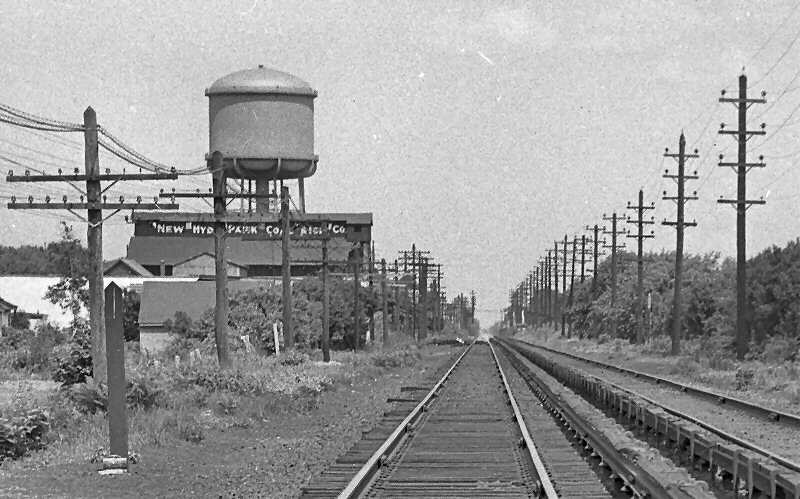 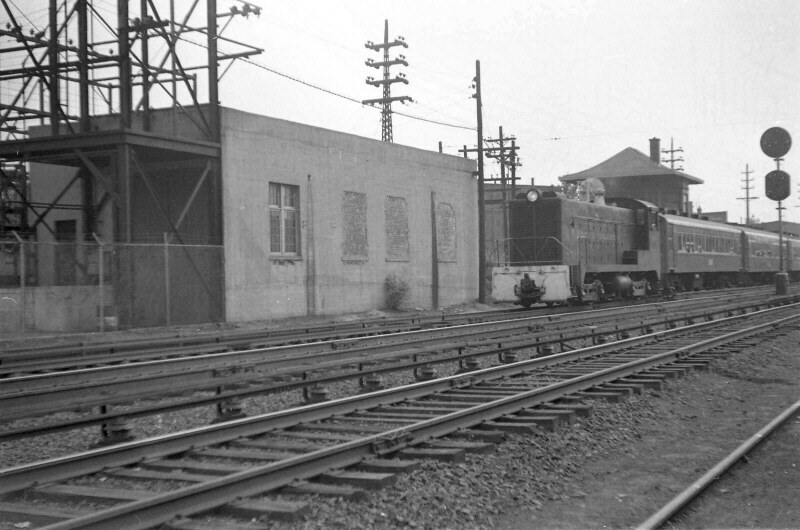 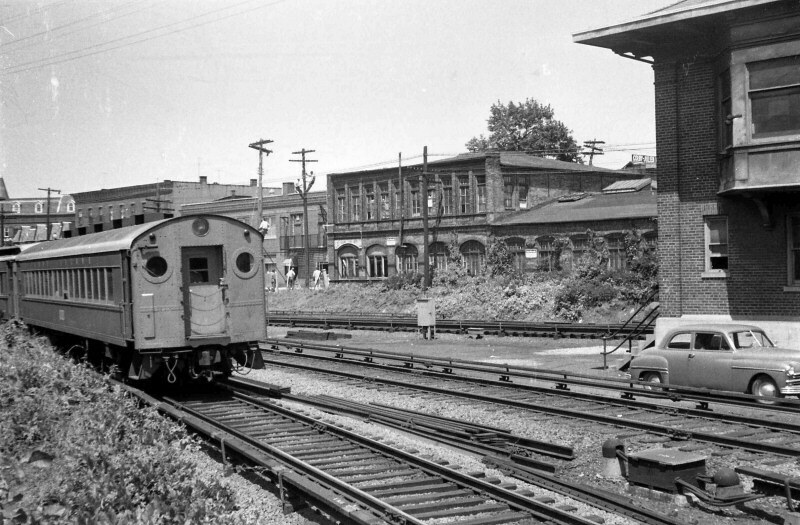 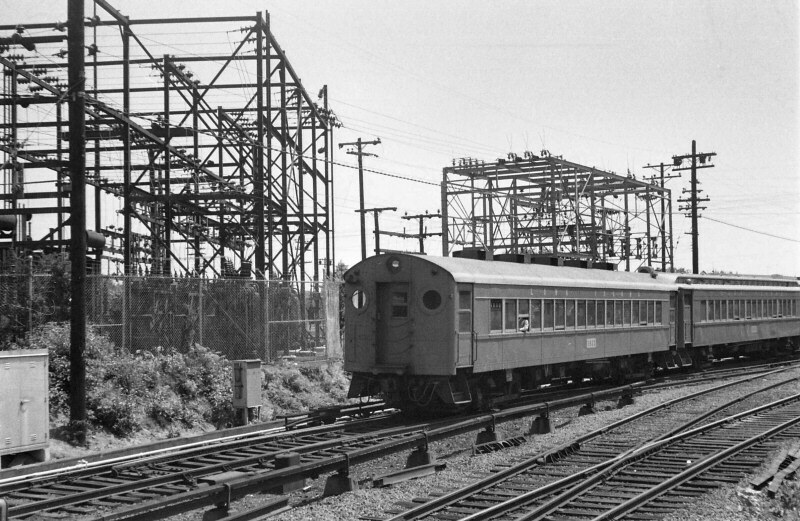 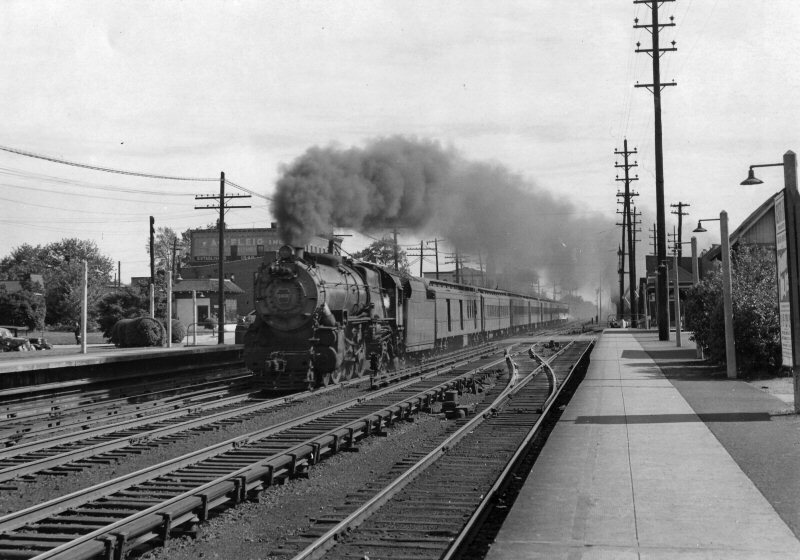 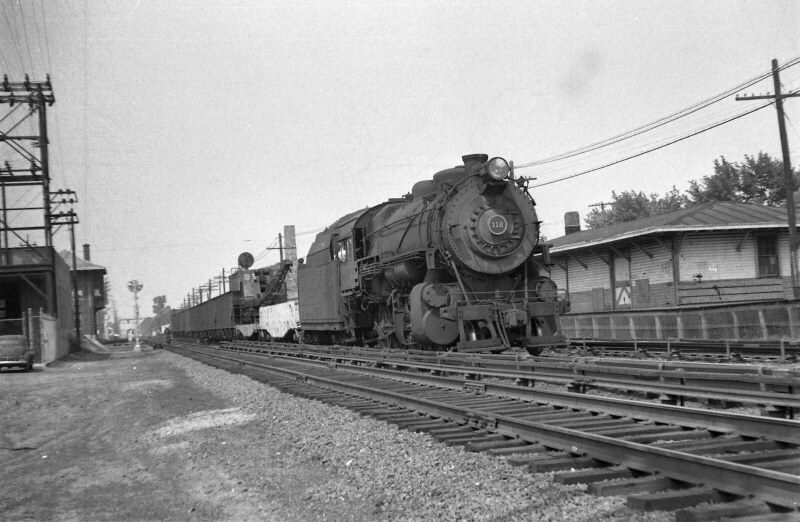 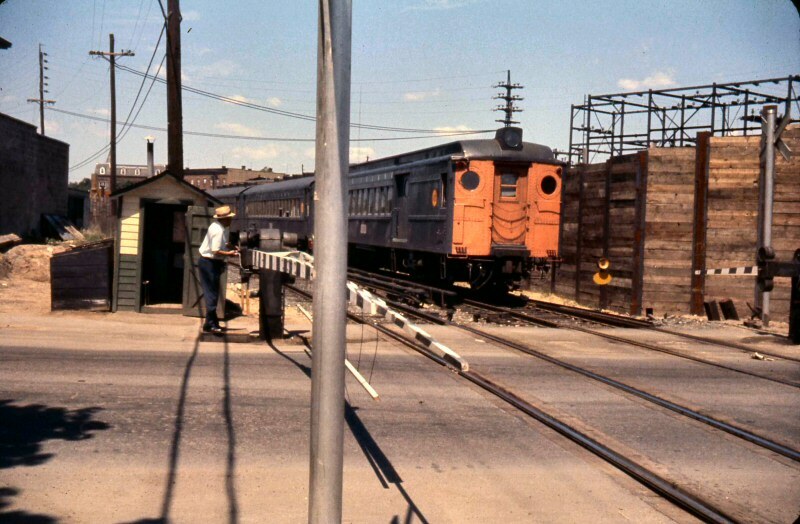 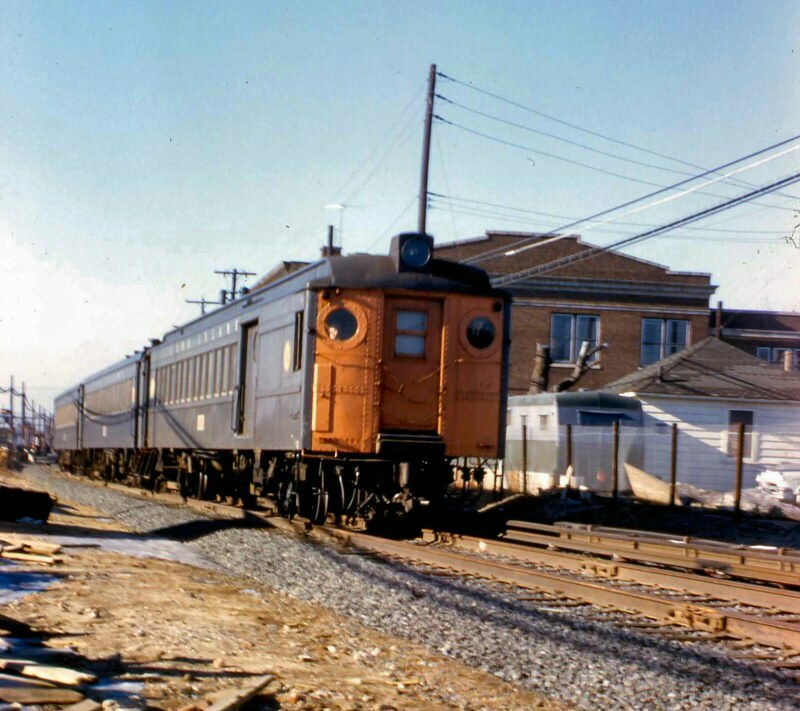 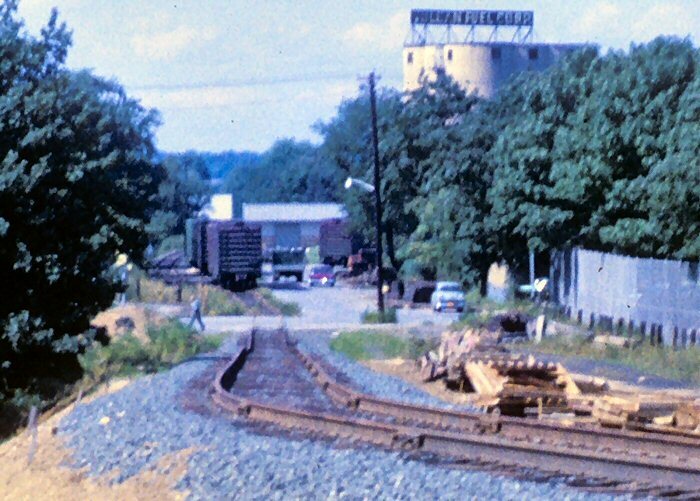 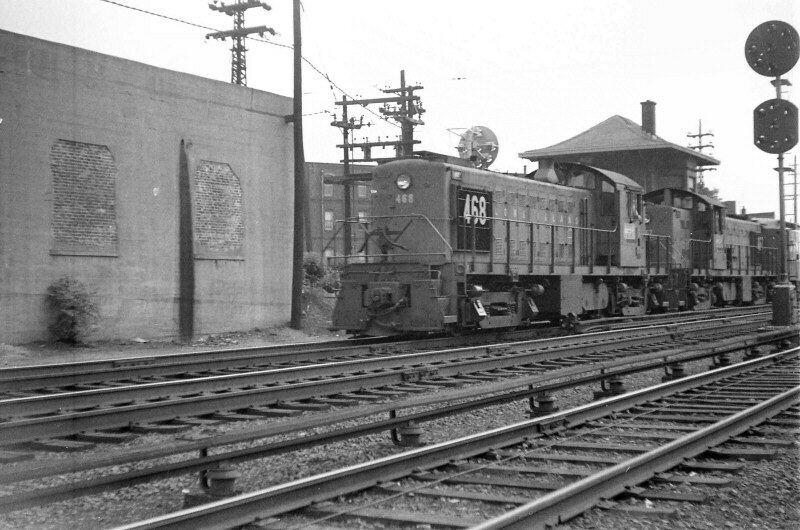 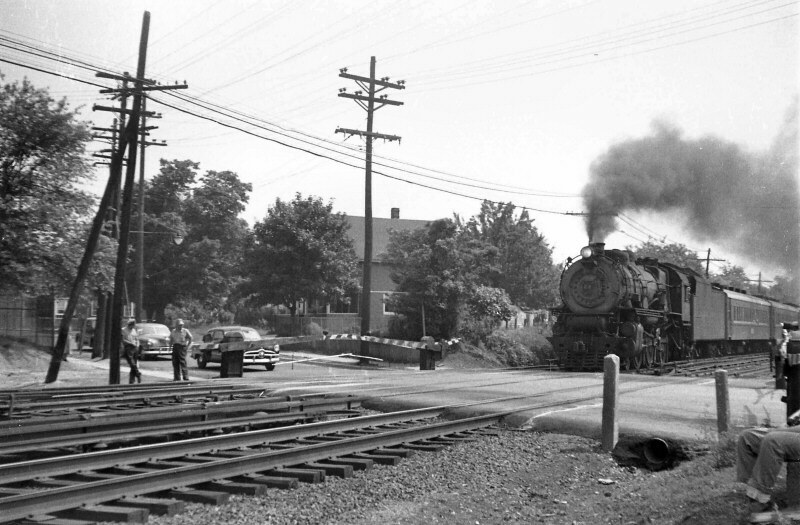 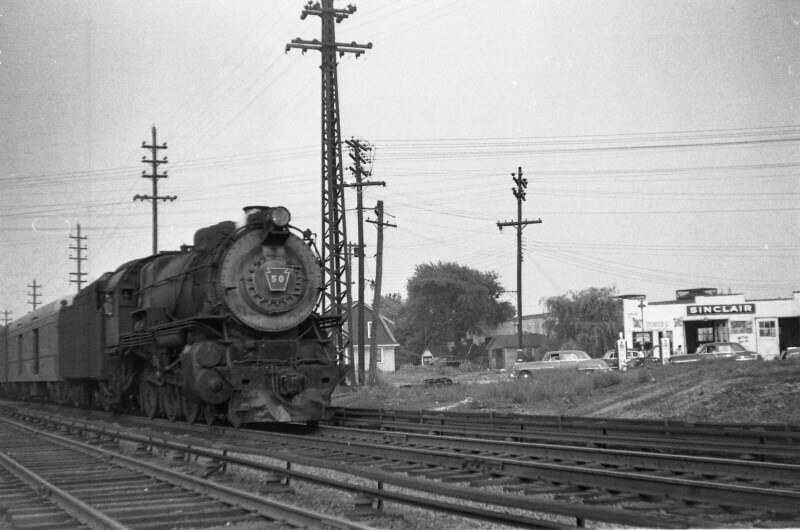 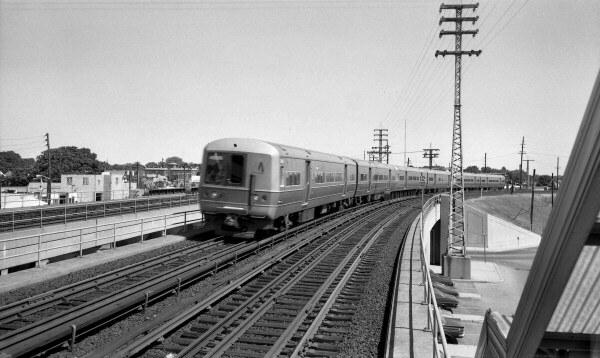 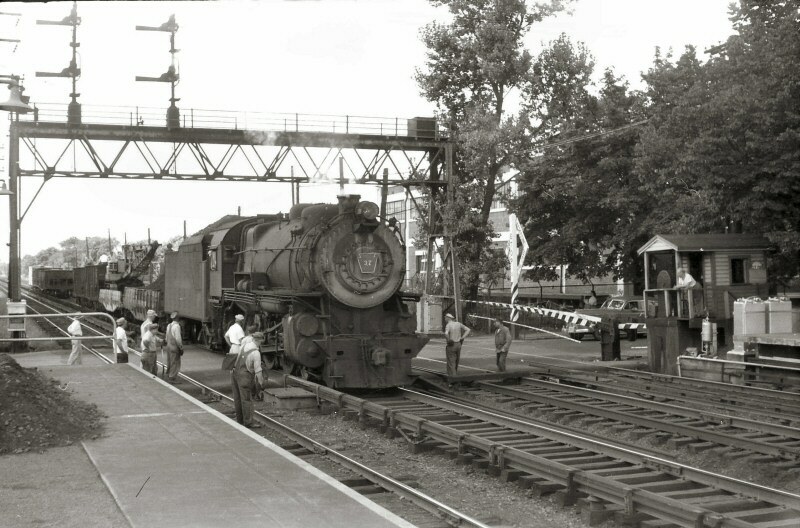 RS1 #469 in Tichy scheme pulling a 3-car train eastbound past the old station at Floral Park 06/1955. 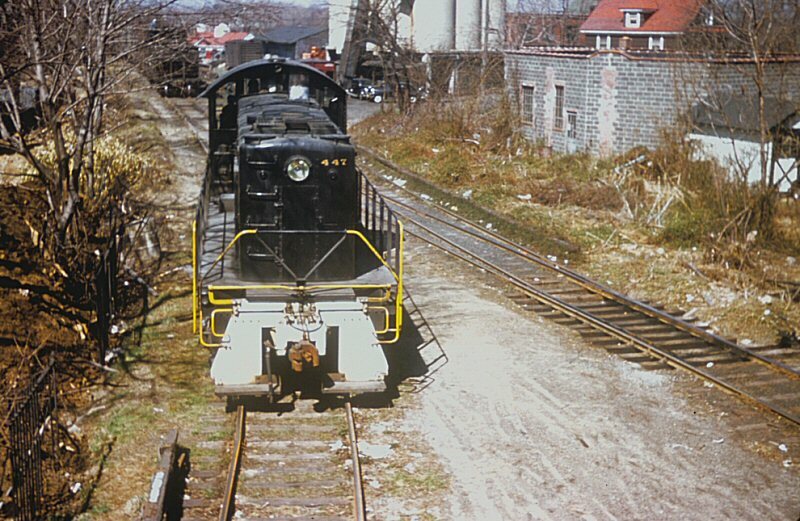 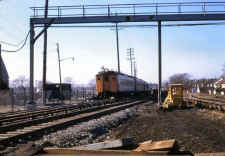 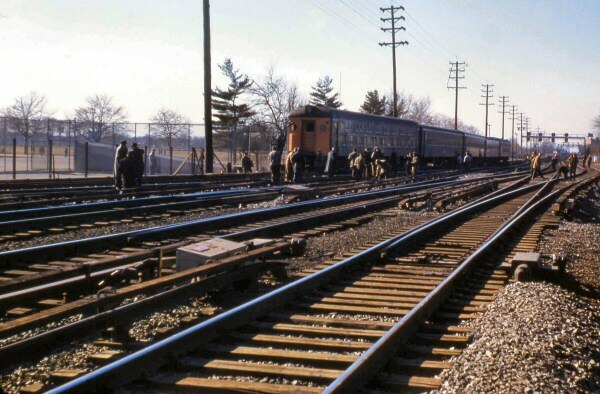 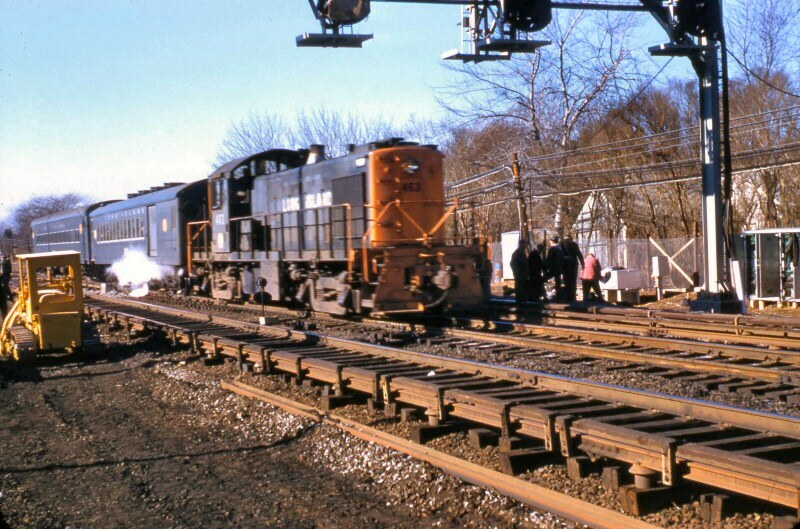 May be an Oyster Bay-bound train judging by the 3-car consist. 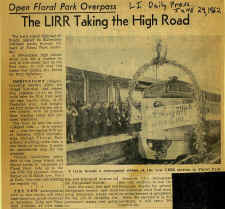 The train is operating on the express tracks. 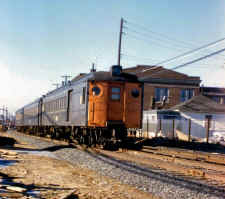 The car has Dashing Dan at the left end and the 2nd car is in the dark gray color scheme. 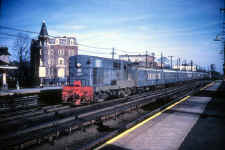 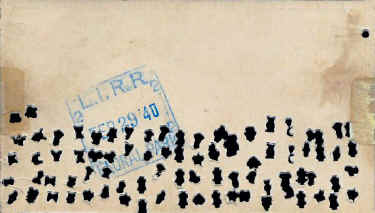 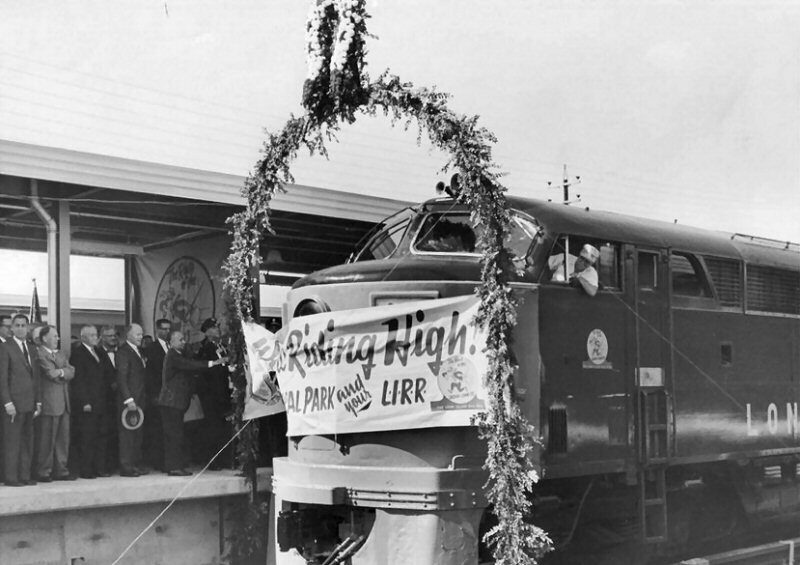 Dan first appeared on passenger cars in February, 1959, according to the "Long Island Railroader." 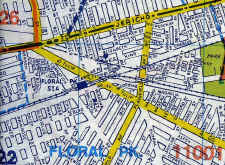 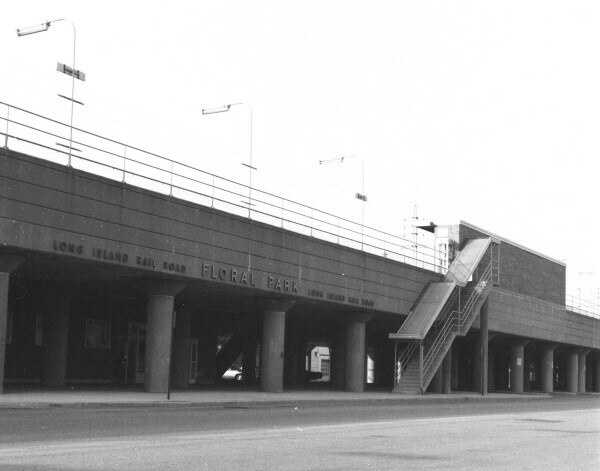 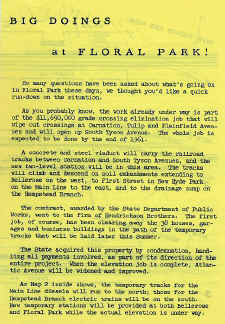 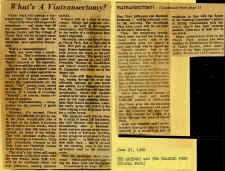 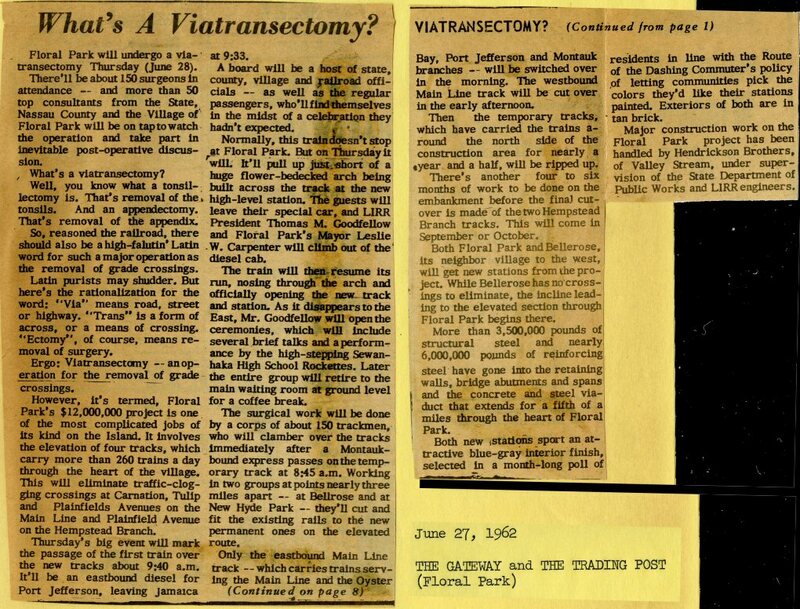 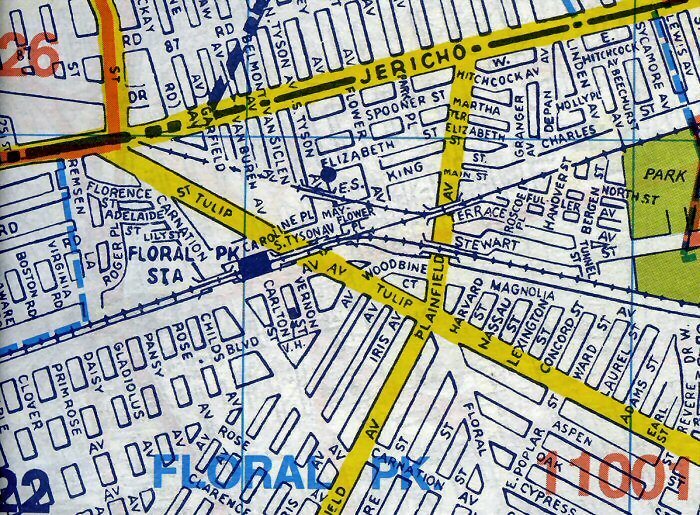 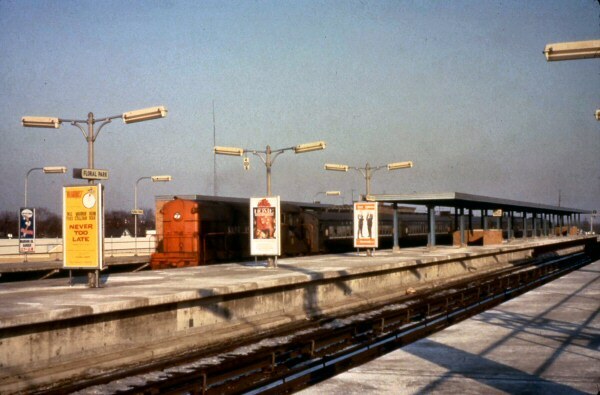 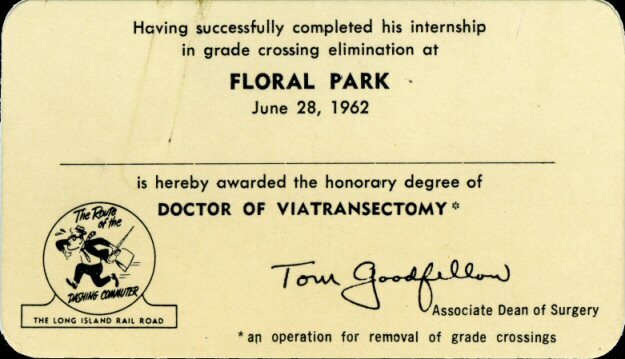 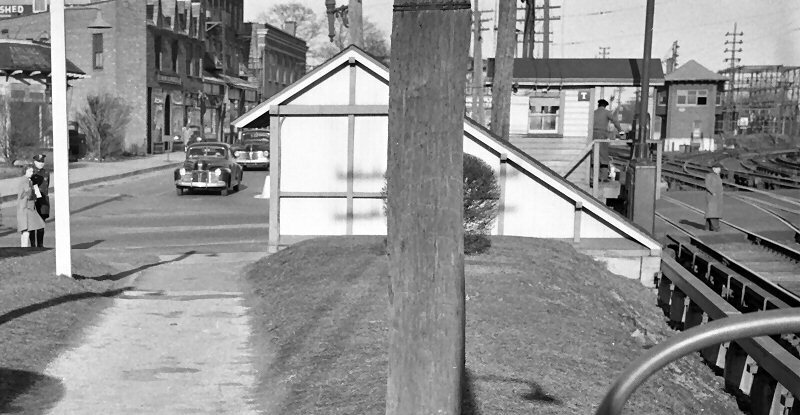 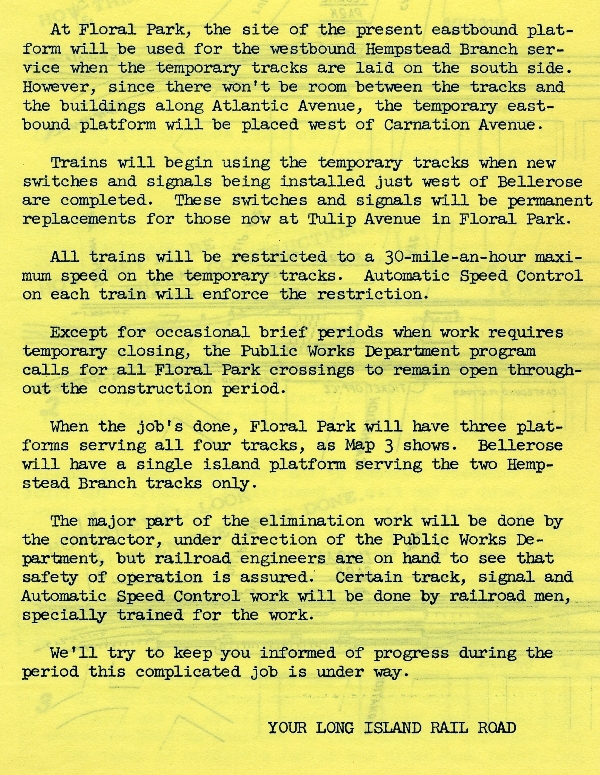 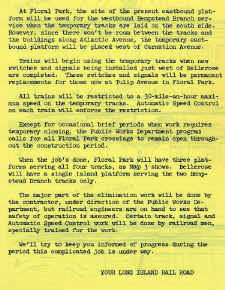 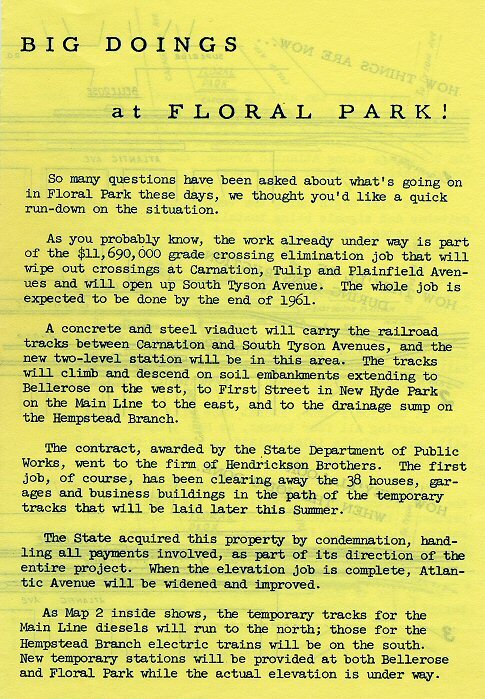 The grade elimination project at Floral Park began in September, 1960. 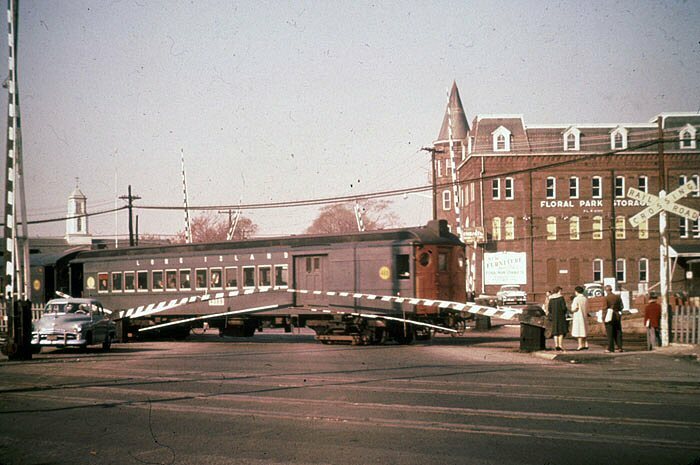 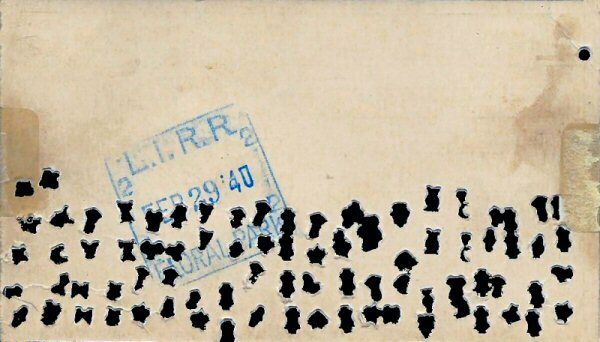 There doesn't appear to be any construction evident in this image but everyone is wearing winter coats, so, despite the age of the automobiles, I would say the image was shot shortly after Dan was stenciled in February, 1959.